Yesterday we moved into a New Moon in Gemini phase and today marks Summer Solstice and the sun in Cancer according to my We'Moon 2012 book. Summer Solstice is a time for celebration. I wrote about Summer Solstice last year http://pixiedusthealing.blogspot.ca/2011/06/summer-solstice.html. It marks the longest day of the year for us in the Northern Hemisphere because the earth's axis is tilted towards the sun. It feels to me like the earth is turning her face to the sun for that warming, nurturing feeling of "all is right in the world". It is also the time that officially marks our moving from the season of spring into that of summer. With the sun in Cancer, there's a good chance what drove you out of the relaxing hammock was the thought that there was something you needed to do for someone else. Cancer is a water sign and people that are Cancer "types" or born under this sign, seem to be very good at providing emotional support for others. They nourish everyone else and encourage strength in others. That's the power of the sun during summer solstice as well. We look to nature to provide that soothing opportunity to feel protected, carried for and looked after. And nature provides. Perhaps because of this energetic feeling of nurturing, and the human struggle between "doing" and "allowing", sometimes this sense of nurture gets a bit misplaced in my opinion. I think at this time of year, we can get really caught up in doing things for others. Parents are busy signing kids up for summer camps and activities. We get the idea that we need to provide the perfect "summer vacation" for everyone. There's that whole "prom dress nightmare" going on http://pixiedusthealing.blogspot.ca/2011/06/prom-dresses-and-bach-flowers.html And if that weren't enough, during this shifting times, most people I know have some sort of crisis occurring within their circle of friends or family that can draw energy away from self in an effort to provide for others. I'm not saying that kind of loving concern and help isn't important and valuable, but it's always about finding balance. Summer Solstice it would seem isn't supposed to be a "heavy" event. It isn't about that internal reflection that Winter Solstice might be. I don't think it's about reflection, setting your course, or focusing intention. I think it's meant to be "light". Isn't that the point? Light in terms of celebrating what's easy, what is being done for you, what is good and positive in your life. It's about recognizing that sometimes the best thing you can do for everyone is to look after yourself and if that means lying in the hammock with your face to the sun or feeling the rain- go for it. Once you feel nourished yourself, you'll have energy for others. And if those "others" in your life are doing the same thing, they might not need your help anymore. Maybe they didn't really need it in the first place! So, in my opinion, today should be a day of doing whatever feels good and easy for you. In fact it might be a good day to "do" nothing. In searching for today's picture I found a great blog http://rhythmofthehome.com/archives/summer-2010/summer-solstice-celebration/ If you need to do something to celebrate Summer Solstice this seems like just the ticket. 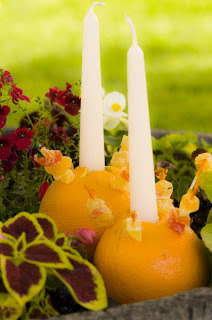 Heather Fontenot, the author of this blog gives instructions for making Fairy Wands, Fairy Baskets, and my personal favorite the Sun Candles of today's picture. That's the kind of "light" I'm talking about! So let go of the need to "do" today and just enjoy the sun in your face, the light in your world, and the love that nature provides.